Avoid loud and aggressive persons; they are vexations to the spirit. If you compare yourself with others, you may become vain or bitter, for always there will be greater and lesser persons than yourself. Enjoy your achievements as well as your plans. Keep interested in your own career, however humble; it's a real possession in the changing fortunes of time. Exercise caution in your business affairs for the world is full of trickery. But let this not blind you to what virtue there is; many persons strive for high ideals, and everywhere life is full of heroism. — Visit Mardi's Enchantment on Facebook! First, A Midsummer's Night Eve is also a fantasy movie. Second, Disney who used a lot of classical music in their films. 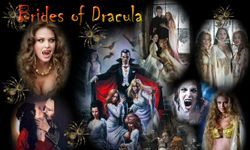 The last video is the music played during the waltz between actress Kate Beckinsale and Dracula. Catch the magic of fairies! Select Image for Larger View! vampires I found lurking about.